Her favorite kitten died in her arms. The little boy who sat next to him in school was killed in a car accident. Her grandpa who was her “best buddy” had a heart attack and died in the ambulance before they got to the hospital. If you have already raised your children, you have your own stories to tell about their experience with loss. How did they react? What were their concerns? What was most important to them? As much as we might want to, we cannot prevent our children from facing difficult losses in life. They will come. When they do, there are some important things you as a parent or grandparent can do to be helpful. Let them cry. Do not try to talk them out of their grief. Just be there with them. Children who are old enough to love another person are old enough to grieve. Let them play, even around the casket. 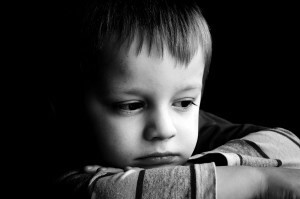 This is normal for children, as they tend to slip in and out of strong emotions. Their tears are very real one minute, and the next minute they are chasing a cousin through the pews. This is very normal, especially for younger children. Help them anticipate what will happen and why. For example, “there will be lots of flowers, because that is a way for other people to show us how much they loved grandpa”; or “he will be lying down in the casket, with his eyes closed, and he will be wearing his Sunday suit”; or “people will be crying and very sad because they won’t see him again until we get to heaven”. Encourage them to talk with you about what death means. Don’t use euphemisms, as they can be confusing to children who tend to think very literally. “She is sleeping” or “is asleep in Jesus” is not helpful to a child. Share in both their grief and their hope! As adult believers, we can experience deep grief and loss, with incredible hope and joy at the same time. Children are likely to experience only one of these emotions at a time, seeing things as either black or white. They will fluctuate between the two. Let them participate with you in the rituals of funeral planning, family visitation and the funeral itself. These rituals provide a way for the child to be fully included in the family, to not be left out. Including them will allow them to know that the family can make it through hard things – together. They will see and experience the comfort that comes from prayer, scripture and the kind words and actions from others. They will know that death and a funeral is not something so horrible that they can’t be there to experience it. They will be able to take part in the important ritual of honoring the dead person’s life, and the important role that they played in theirs. They will hear about heaven and life with Jesus that is free from pain and tears. They will learn through your faith about the meaning of death and life, even life eternal! Realize that grief is a process, not an event. Keep an open posture, so that your child can talk with you weeks, months and even years later about the death and its meaning for them. If you are concerned about a child in your life who is dealing with loss, talk with your pastor or call to talk with a Lutheran Family Service counselor at (515) 573-3138.